The IKF/PKB Is The ONLY California State Athletic Commission "APPROVED" Semi-Contact Kickboxing and or Muay Thai Competition and the ONLY "Sanctioned" Semi Contact Kickboxing / Muay Thai Rules Set In California! ANY OTHER EVENT resembling the IKF/PKB competition or even using the words "Kickboxing" and or "Muay Thai" or "Muaythai" in their advertisements and is not sanctioned by the IKF or IKF/PKB is considered an unsanctioned Illegal event. This includes ALL AGES of athletes, fighters or participants whether in a boxing ring, MMA cage or floor / matted floor competition. 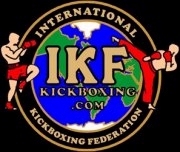 ANY OTHER EVENT resembling the IKF/PKB competition or even using the words "Kickboxing" and or "Muay Thai" or "Muaythai" in their advertisements and is not sanctioned by the IKF or IKF/PKB is considered an Unsanctioned Illegal event. Anyone and Everyone participating on such events are subject to suspension and additional disciplinary actions.